“What, fish feeding off the dead skin on my feet?” Ew! Well, it looked harmless enough and I didn’t see teeth like on a piranha or shark so why not? Seems like this is the new thing on islands around the world. I saw this offered first in the Dominican Republic and now here in Thailand. Some go by the name of “Dr. Fish” and in Thailand can cost from around $2 to $7 for 15 minutes of “cleaning.” I’ve also seen this packaged as part of a tour. 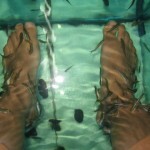 After rinsing off our feet, we gingerly placed them into our own private glass-walled aquarium. Before we even submerged our feet, the fish were eagerly swarming to the top of the water! Fish soon nibbled between our toes, at our heels, at our legs, and pretty much everywhere that was underwater. Kind of tickly, but not painful in the least bit! The most popular spot seemed to be my friend’s right heel! They pretty much swarmed there non-stop! Afterwards we were shocked to find that the tough skin on our heels was actually gone and our feet and legs felt softer! Much easier on the skin than those pedicures where they scrape a ton of dead skin off with those rough boards!